Canada, the United States, and the U.K. have recently witnessed a popular revitalization of left-politics that would have been unthinkable just a few years ago. Jeremy Corbyn, the newly elected Leader of the Labour Party in the U.K., unabashedly appeals to the intellectual traditions of “Old Labour” with a leadership campaign that includes promises to fight austerity, expand public ownership, and invest in public housing, healthcare, and transportation. Bernie Sanders, self-proclaimed democratic socialist and potential candidate for President of the United States, has gathered hundreds of thousands of supporters through promises of doubling the federal minimum wage, implementing single-payer healthcare, and increasing revenue through a more progressive tax structure. In Canada, the NDP has been leading in polls since the beginning of this election cycle – although their campaign has been markedly more centrist than that of either Sanders or Corbyn . Indeed, as Leo Panitch and Colin Leys write, it would appear that nearly three decades of “constant reductions in social services, chronic unemployment, increased stress, longer hours and increased insecurity at work [has robbed] ‘market society’ of its appeal” for a growing segment of the electorate . If the history of Canadian socialism has two major lessons to teach, it is that Canadians will often respond to calls for radical egalitarianism, and that opportunities to reach large numbers of them can emerge swiftly […] And we have the most radical stimulus of all: a totalitarian neo-liberalism violently imposing market logic on every human relationship, no matter the danger to living human beings and the communities that sustain them. What is primarily lacking is a powerful political party that wholeheartedly believes in a post-liberal egalitarian order . A brief history of the NDP since its foundation in 1961 reveals tensions between competing intellectual currents within the party, but so, too, can it provide an argument for the abandonment of “Third Way” politics and a turn towards the “post-liberal” order that McKay describes. 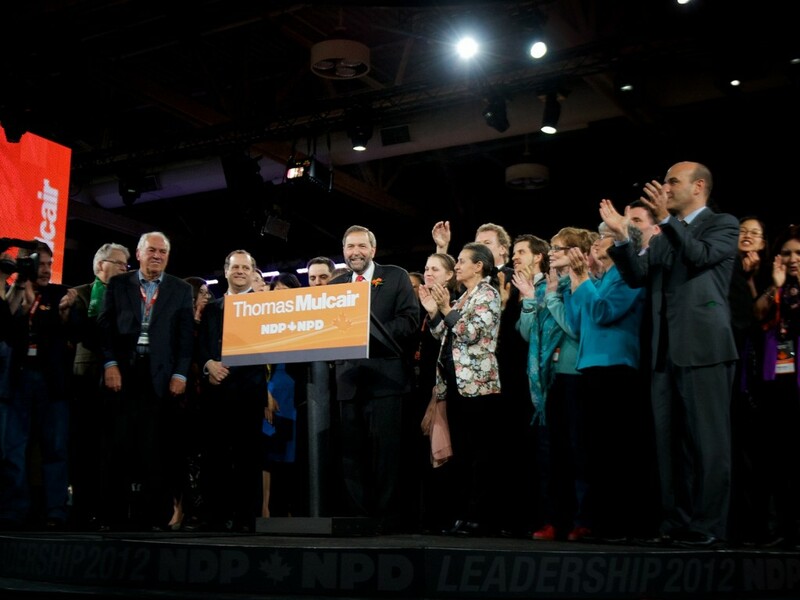 The NDP was never envisioned as a wholly socialist labour party. 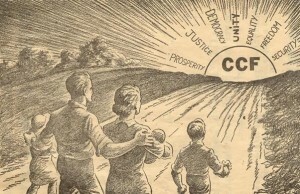 Intellectually rooted in the 1956 Winnipeg Declaration of the Co-operative Commonwealth Federation (CCF), the NDP did not include the destruction of capitalism as a goal. Instead, the party sought to offset the most destructive aspects of capitalism –largely through redistributive plans or public ownership. The theoretical foundation of the new party rested upon Keynesian concepts of “managed-capitalism” and made no reference to implementing a socialist programme . The NDP was forced to re-examine its core tenets in the 1980s, when social democracy began to lose popularity in light of neoliberal globalization. Larry Savage writes, “Beginning with the Trudeau government’s wage and price controls, federal and provincial governments of every political stripe (including NDP provincial governments) led an assault on trade union freedoms designed to weaken the collective strength of the labour movement” . The extent to which the NDP has embraced the neoliberal ethos is most visible at the provincial level. The Romanow government in Saskatchewan, for example, embarked on a program of “fiscal austerity […] and capped social assistance rates […] while allowing the minimum wage, once one of the highest in Canada, to fall to one of the lowest” . “Rae Days” in Ontario were similarly characterized by efforts to shrink the public sector and enact a program of fiscal conservatism. In Nova Scotia, the Dexter administration presided over a budget in 2010 that Bryan Evans describes as: “an unequivocal turn to austerity:” $1.1 billion in public expenditure cuts, income tax reductions for those earning between $93,000 and $150,000 per year, and de-indexing the public service defined-benefit pension plan . What I Learned About Politics, the recent tell-all book by Nova Scotia’s former NDP finance minister Graham Steele, reveals the cognitive dissonance inherent within the party’s tacit acceptance of the self-referential logic of the market . Increased taxation on the wealthy could not produce revenue, Steele tells his readers, as “Nova Scotia doesn’t have enough rich people” and “the rich, of course, know better how to move their money around to avoid taxes” (134). Those who called for tax increases, not decreases, for the highest earners in the province were simply part of a vocal group looking for “someone else to pay” for their entitlements (112). In Steele’s analysis, the agents perpetuating the “Iron Grip of the Status Quo” are not the political and corporate interests lobbying hard for the most severe pillars of neoliberalism. Rather, the offenders are recalcitrant bargaining units that fail to agree with ‘common sense’ public sector cuts (146-7), citizens who are “used to a certain service being offered in a certain place at a certain time in a certain way” (121), and even community members lobbying city council to keep local fire stations open. These would appear to be unusual charges coming from a cabinet minister in a party that remains a constituent member of the Socialist International, but they are the inevitable result of the inexorable and axiomatic logic of capitalism – that market solutions are prima facie correct solutions. The present order is marked by glaring inequalities of wealth and opportunity, by chaotic waste and instability; and in an age of plenty it condemns the great mass of the people to poverty and insecurity. Power has become more and more concentrated into the hands of a small irresponsible minority of financiers and industrialists and to their predatory interests the majority are habitually sacrificed. When private profit is the main stimulus to economic effort, our society oscillates between periods of feverish prosperity in which the main benefits go to speculators and profiteers, and of catastrophic depression, in which the common man’s normal state of insecurity and hardship is accentuated. The “Third Way” march to the right is not inevitable. Growing discontent over the results of more than thirty years of neoliberalism, coupled with the material conditions resulting from the crises of 2008-2009, have created a circumstance wherein the Canadian mainstream left has much to gain from imagining “a radically different world that does not generate patterns like the ones we are now seeing” . The party could stand to benefit enormously from a sober evaluation of its history and the revival of a parliamentary socialist tradition. It is important to remember that both Sanders’ and Corbyn’s platforms were developed within the context of intra-party leadership campaigns, while the NDP are currently campaigning in a federal election. It remains to be seen if the populist rhetoric remains firm during their respective national elections. Leo Panitch and Colin Leys, The End of Parliamentary Socialism: From New Left to New Labour (New York: Verso, 1997), 270. Ian McKay, “For a New Kind of History: A Reconnaissance of 100 Years of Canadian Socialism,” Labour / Le Travail 46 (Fall / Automne 2000), 124-25. Bryan Evans, “From Protest Movement to Neoliberal Management: Canada’s New Democratic Party in the Era of Permanent Austerity,” Social Democracy After the Cold War, ed. Bryan Evans and Ingo Schmidt (Edmonton: AU Press, 2012); See “The Waffle” for an earlier attempt at moving the NDP to the left. Larry Savage, “Contemporary Party-Union Relations in Canada,” Labor Studies Journal 35, 1 (March 2010), 9. Richard Fidler, “The NDP, poised for power, but to what effect?” Canadian Dimension 4 March 2013. Graham Steele, What I Learned About Politics: Inside the Rise – and Collapse – of Nova Scotia’s NDP Government (Halifax: Nimbus Publishing, 2014). Evans, “From Protest Movement to Neoliberal Management. Ian McKay, Rebels, Reds, Radicals: Rethinking Canada’s Left History (Toronto: Between the Lines, 2005), 3.